The H�tel-Dieu of the Hospices de Beaune was used as a hospital until the 1960s, when medical activities were transferred to a new building. The H�tel Dieu is now a museum that shows how the Hospices cared for the sick and indigent from 1443 through the 19th Century. 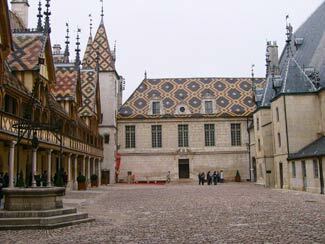 The Hospices de Beaune were built by Nicolas Rolin, the Duke of Burgundy's chancellor, who hoped to earn a place in heaven through good works. With his wife, Guigone de Salins, Rolin devoted much of his fortune to caring for the 75% of Beaune's population who were poor and starving after the Hundred Years' War. After more than 550 years, the charitable organization is still supported by income from the vineyards that were left as an endowmnt by the Rolins, along with profits from annual wine auctions that have taken place since 1859.